A slender stemmed, twiggy shrub with blue-green leaves in the summer. In mid-summer, dense clusters of small pink, urn shaped flowers appear. 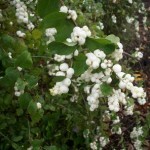 The fruit is a fleshy white berry that develops in the fall and can last until early winter. The fruit is attractive to birds, but it is poisonous to humans. It is a native plant to the West Coast. 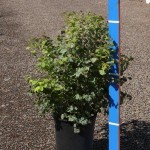 It is tolerant of most soils and takes sun to shade.